Our Peoria clinic, located at Greenway & 75th Ave., offers medical and holistic treatments for better health. 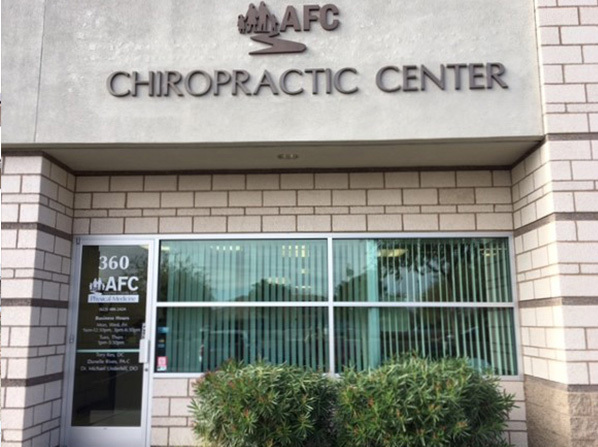 Led by Dr. Tory Kes, AFC Physical Medicine & Chiropractic Centers of Peoria focuses on the treatment of nerves, muscles, and bones through a number of unique therapies, including chiropractic care, sports medicine, and much more. This approach to healing integrates both the medical and chiropractic philosophies to address and manage the root causes of your pain. Using advanced diagnostic equipment and high-quality therapies, our chiropractors and physician's assistants are here to accurately diagnose and treat your chronic ailments. I have to say the staff here is wonderful and full of life. I have been going for therapy since January and felt the difference in my body the first week. Their program has helped my whole body relax and the pain and tingling has stopped. Thank you AFC Peoria for your attention to detail and healing. My husband referred me to AFC. Everyone has been wonderful, educated me on my specific case, and have a plan ready for me. Cant wait to begin.